Testimonials | Stop procrastinating now! Angela Van Son consistently yet gently coaches me to see how much procrastination costs me … in peace of mind, and in lost opportunities for new clients. With her coaching I’m consistently taking action steps to build my business. Even better, she encourages me to celebrate when I’ve completed an action. That helps me appreciate the power of doing things now, rather than putting them off. And I’m finding I’m happier about what I’m doing, too! Angela, you are a great coach! I wish you a lot of success. Having experienced your kind, surprisingly simple and yet brilliant style of coaching, I know that many others are going to find motivation and inspiration thanks to you. Way to go!! Hi Angela - writing to let you know how much i'm benefitting from your work...I have found each of your tools useful - different ones for different jobs...different types of procastination. 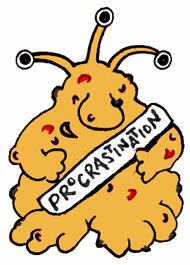 Now that i'm looking at it, I see procrastination comes in many flavors.. I've re-adopted the toad. He was with me for more than a decade when i was in Real Estate. He's now Mon, Weds, Fri for small stuff that I 'm dreading doing. The 5 minute thing...Something REALLY BIG. I consider these 5 mins 'holding the dream' time. I am grateful for them all! You can also check out the great feedback for my free e-course on my new website.